A simple and convenient solution, this Choice 6" chrome menu / card holder is perfect for showcasing your name cards, table numbers, food items, menu specials, and reserved signs! 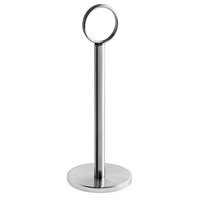 This holder allows you to attractively display information right on your tabletop or buffet line. Your customers will appreciate the convenient information available to them as they can pick and choose from your best options to make the most of their dining experience. Sturdy menu holder with good heft. The clip / holder is tight and the paper item easily stays put without moving around or falling out. Your store have so many amazing products, thank you! Love the height for this card holder, it is very useful for holding flier as well. I love how small this is, it's perfect for what I need it for. it looks really nice on my table. looks better then the longer one I purchase a while back. I actually ordered these and did not receive these, so Webstaurant shipped a new order right out! I love these food label holders. They are the perfect size. 6 inches high, this Menu/Card Holder is easy to use when inserting or removing information. Posting a meal menu at all tables at a resort is a very good use for this holder, and its base is very stable. This holder elegantly displays postcards, photos, etc. The base is heavy and has a solid weight to it. It's super easy to use – just slide the card through the rings on the top and you're good to go. We're using these with the 1 to 100 Plastic Table Number #4071100 and they're a perfect match. While these aren't really tall, they do hold the number very tight and also don't tip over easy. The weight of the base is just right in my opinion. This stainless steal 6 inch menu and cardholder is very reasonably priced. The ensures it will be long-lasting and hold up to multiple uses. The ring on the top is where the card or menu will be held. Is this item does get dirty we do recommend handwashing to ensure it stays shiny and new looking. This menu holder is perfect for our catering needs. We use it to display cards telling the food item and ingredients. This size was perfect to sit in front of our chafing pans. Would definitely recommend. The six inch menu and card holder is exactly what I had hoped. It is the perfect size and design to hold name cards, reserved signs as well as daily special lists. I have not seen one break or snap, even after many uses. The sleek look and the silver color offer a delicacy to any table, and it is tall enough to be seen from a distance. These 6" Menu / Card Holder are durable and have a nice weight to them to keep them in place on the buffet table. Great reasonable price. We love using these holders for our laminated food and drink menus. They're so durable and sturdy. We love them and use them on every table. I absolutely love this product! This 6" menu card holder works great! Great quality! The card stays put the rings are tight holding. Used at our bakery to display menus and specials but as well as to display business and loyalty cards. Simple but effective item that stands out. These card holders are so cute and are used for everything in the bistro. They hold our menus and are also used for table name cards. They are also easily cleaned and reused. These card holders are perfect--the right size so our employees can spot them easily and they hold up well. The others we used kept breaking but these are sturdy and work great. These card holders are so classy and timeless. They are strong, sturdy and can be used anywhere. We use them for every one of our events! We love them! I use this to hold up signage when I do events and they work really well. Would be nice if they were a little heavier though. This is our first order for the Card Holders. When the shipment arrived, I was very pleased with the design of these card holders. I used them to hold food name cards at a Women's Brunch. I will be ordering more. This Card holder works better than I expected! It holds my label cards for my soap and lotion displays. It looks classy but not obnoxious. I am ordering more right now. Quality product at a very reasonable price. I bought this holder to display an 8 1/2" X 11" sign at a school fundraiser. It did require that the paper to be laminated in order to stay upright. These are great. They look nice. They hold the card firmly. The ring is a little annoying because it can block some text, but we are generally very happy with them. These were used for table numbers, so the height worked well. Each holder is just the right weight and very stable, no need to worry about this getting knocked over. Great quality on these 6" card holders, solid pieces. I use them with the chalk cards (purchased here also) They look great and perfect height next to platters at formal or casual catering events. Highly recommend. The 6" Menu / Card Holder works great to display the Veterans Day holiday for the little ones, "Happy Veterans Day." on my island. When they come up stairs and see the Veterans Day sign they know it is officially Valentines Day. You can use normal paper to make the sign. The menu card holder was perfect for my parties, kept everything organized and made the tables look very professional, easy to read and clear display made no confusion for my guests as to where they were to be seated. Would definitely recommend such a great quality product!!! My first impression was very good.. the look of this steel card holder is sleek and attractive, a shiny base and yet streamline so it doesn't take away from your focal point (your food display). The ring that holds your card or sign message is actually soldered on so it seems that it's not going to ever fall off. Amazing deal at this price we'll be coming back for more. The ring is like a key ring so it will hold your sign very tight; it's also slightly tilted which is an ideal detail for the reader. Nice all around! We used these at a recent catering and they really added an extra level of class to our presentation. I would highly recommend these to anyone who wants to set themselves apart from the competition. Great item. We use these for caterings (too tall for our regular table markers in store). The top coils are tight so they hold a menu card without it sliding. 6" seems to be the perfect size for a buffet set up. A dozen of these is a must have for anyone doing caterings! Work Great for holding information cards for my baked goods, I can move them to location when selling at the local farmers markets also, love their versatility. Honestly, for so little, these things are a steal! We have had them for about a year in a kitchen environment, which we all know things can get broken very easily, and they are all still going very strong and not a single one has broken. The spring that holds the sign is very tight and stays in place very well. I will be buying these again. Great item. This was put through the ringer for our Lenten fish fry and held up without a problem. Sturdy yet easy on the eyes. This should be around for many years to come, and many more fish fries to come. They can be used for our wedding reception tables also. The price and quality were the best in town. Thanks for a great product. I uses these for pricing during my local craft fairs and farmers market! they hold very well and they are nice and sturdy. I love that they have weight on them so even if its windy they wont move. We purchased the 6" menu / card holder to display announcement at our circulation desk. We liked them, but they are rather plain. Still they serve the purpose. I love the clean modern look of these menu cards. I use them in my upscale catering company for most of my events. Guests enjoy reading the cards at each individual dish and I also include information on allergies, which is really helpful. The holders come in various sizes to compliment the various heights of buffet ware. I love these. Will definitely order more. Great price and I love the shine. They are heavy also. They are classy looking. A must order! I have used these card holder at many events, and I love the fact that they are heavy enough to hold larger cards without tipping over. They are very functional and inexpensive.